Sweet jayzus, it’s been a long time since my eyes graced the theme for Illustration Friday. This week the topic is “Eye Glasses”. I feel that this illustration needs a story, so I’m going to tell you one. When I was a little It, I developed a passionate madness for a gorgeous, gorgeous man loved by billions and billions of other people. He was the ideal man for me. A perfect face, perfect profile, intelligent, funny, glorious nose and bottom lip. Who was he? You guessed it, it was Rick Moranis! 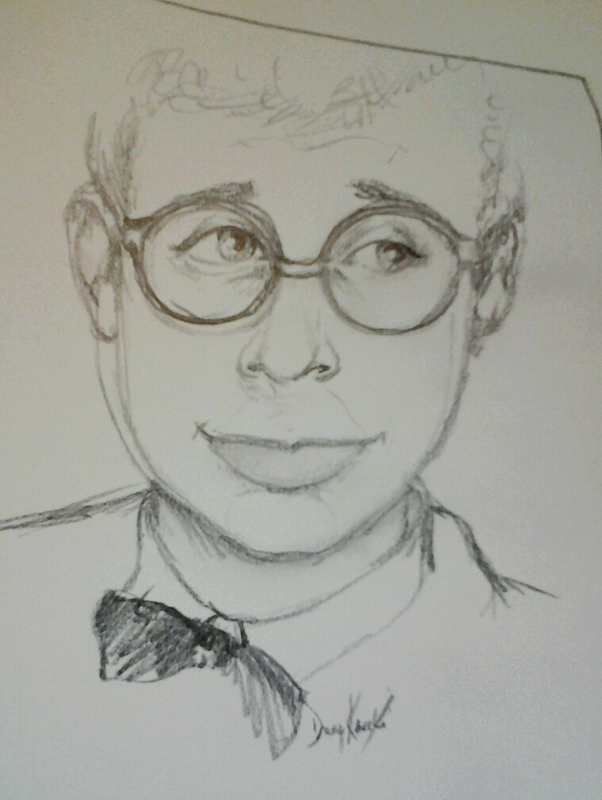 Rick Moranis is still one of the most beautiful men I’ve ever seen so it only made sense to attempt to sketch him for this week’s Illustration Friday theme. When I think of glasses, I think of the beautiful Rick Moranis. And Drew Carey. Drew Carey was another massive crush of mine that (also) still hasn’t fully gone away. This, though…this is about Rick Moranis. I want to say (want) that the sketch looks kind of like him, but that might be the Riesling talking. I absolutely can not draw real things – only the craziness in my brains. Forgive me! Also forgive me for the extra lines. Since I’m not fully unpacked, I have no erasers!! This makes as much sense to you as it does to me…unless it makes sense to you, then…no. No erasers! Gah!